In 2018 smart speaker ownership has doubled in the UK. The most popular voice assistant is Amazon Alexa which is part of the Alexa Echo device, followed by Google Assistant which powers Google Home and Google Home Mini, Apple’s Home Pod and Sonos One. At the moment people mainly use voice assistants to play music, answer questions, set alarm and reminders. Is there an opportunity there for marketers? Yes, a growing one. Alexa provides a set of built-in capabilities, called skills. Skills are the equivalent of apps for mobile devices in the voice assistant world. Developers can create skills which then users can access by asking questions. They have a variety of functions – answer trivia, play games, control lights, music. When a User gives a voice request, speech recognition would connect the request with the most relevant skill and activate it. There are variety of Alexa skills – some developed by big companies, some developed by individuals. To develop a Skill you need some json coding skills. Here is an Udemy course you can check if you would like to develop on your own. Is it possible to sell products with Alexa Skills? One-Time purchases. The same way you can upgrade from a free app to a paid version, you can also do this in Skills. Once you have bought the upgrade it does not expire. Consumables – Content or features that can be purchased, depleted, and purchased again. For example, hints for a game, in-game currency or extra lives. Can you sell physical products via a Skill? Yes, absolutely. Amazon is after all a primarily physical products marketplace. To sell a physical product the Skill must be integrated with Amazon Pay. In this way the voice assistant can use the payment information and use the card payment details and address of the user, which he has entered in Amazon. One great strategy of becoming an Amazon Alexa authority and monetising a skill I read about recently in Gary Vaynerchuck’s book “Crushing it” Full video review here. Using Alexa skills can be a great way to become an authority in an are which has little content. For example, if you are an accountant and you record answers to all the most common questions people ask and upload them in an Alexa skill, you are likely to be the authority. This allows you to do upsells, in-skill purchases, or simply get awareness about your business without paying for it, yet. The main resource is getting your content recorded and having a Skill developed. It does require some technical skills and there are few companies which offer support. There are no ads yet, although you are charged a percentage of all the sales you make via the platform. This is not going to stay for too long – sponsored Skills on the Flash Briefing(the Skills store in Amazon) will probably be the next step, once there is enough competition. The equivalent of Alexa Skills are the Google Assistant Actions. There is an open developers’ guide on how to create these and even some easy templates to make games and competitions. The process of creating a Google Assistant Skill also required some coding skills and can be easily outsourced. Can I sell products on Google Assistant? Yes, and for this you need Shopping Actions. At the moment purchases are only available in the USA where you have Google Express. Google Express is an online marketplaces where you can order from local stores and have our goods delivered to your home for free. The best part is that you can combine your purchase from several different stores, instead of committing to one. The purchase is possible via Google’s platform and is now available as part of the Google Home and Google Home Mini experience in the USA. If your store is in the USA you must fill a form of interest and wait for approval. Once you are approved you can set up A Storefront via the Merchant Centre. To be be able to sell you must qualify by having clear return policy, terms and conditions, contact information. Google’s goal is to make the shopping experience more and being an honest seller is the first box to tick. What exactly is Google Shopping Actions? Simply put, Shopping Actions enables retailers to display their products on multiple Google platforms via Google Express, including Google Search, the Google Express mobile app and the Google Assistant for mobile and Google Home devices. When a user does a voice search for a product without mentioning the brand, Google Assistant will select products based on the relevancy of the search quirie, popularity of the products and the proximity of the store. How much does it cost? Creating Shopping Actions is easier, especially if you know how to work with the Merchant Centre. As an e-commerce program you are not charged by click, but by sale – the same principle like on Amazon. If you are using Local Inventory Ads they may appear as a suggested product on Google Home/Home Mini, but you still will not be charged for a “click”. Will there be sponsored products on Voice search? Probably. The whole voce assistant trade is in such an early stage that it is not clear how exactly it would develop, however when competition rises there most likely be a way to promote products with ads. For now the field is very new and still to come to markets outside of the USA. What can I do as a marketer right now? If you are in Europe, you cans tart by developing Alexa Skills, recording answers to important searches from your niche and gaining authority. If you are an e-commerce seller on Amazon you can make sure you integrate your skills with Amazon Pay and allow voice sells. For US e-commerce sellers, getting your store approved and starting with Shopping Actions is a a next step. As the program is quite new it might take a few years until small businesses can benefit from this, but it will surely be opened to small sellers at some point. 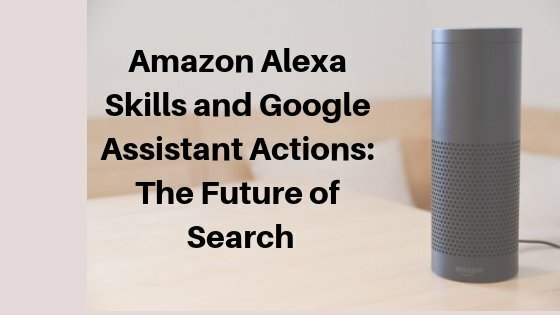 This entry was posted in Marketing Strategy and tagged alexa skills, amazon, ecommerce, google assistant, google shopping.